So did my advice pay off, G-MANN? No problem, glad it worked for you. Need For Speed 2 was rather different to the original since it deviated from the previously realistic nature, settling for a more arcade feel that we are accustomed to in modern day Need For Speed games. Ugh. The traffic cars can be driven if you enter cheat codes, shall I give them unlockable stars? The UFO that is seen in the movie set track can also be accessed as an unlockable vehicle. Indeed there are some more unlockable "vehicles", which are based on scenery objects. These are the UFO, police hovercar, sewage hovertruck, handcart, log, covered wagon, 3 different souvenier stands, 3 different crates, outhouse, monorail and even a life-size model of a Tyrannosaurus Rex. None of these have any real speed or handling, you only drive them for novelty value. I could get some pictures if anyone would like, but I would only list these in the comments rather than make separate listing entries. Released in 1997, Need For Speed II allows the players to drive 9 of the most exotic supercars in the world at that time, including the then-fastest production car ever made, the McLaren F1, the not-for-sale concept cars the Ford GT90, Ford Indigo (the bonus car that had to be unlocked) and the Italdesign Cala, the racing version of the Lotus Elise, the GT1, and the one-off hand-built Isdera Commendatori 112i, the prototype for a never-realised production run of exclusive 212mph supercars that were to be sold for $450,000 each. The other vehicles listed on this page make up the road traffic that can be turned on and off at each track (except Proving Grounds, there is no traffic there), to drive these vehicles you must enter cheat codes. The player had the choice of racing around 6 different tracks set in picturesque locations around the world; Proving Grounds (a test track in Norway), Outback (Australia), North Country (a mix of Germany and the Netherlands), Pacific Spirit (Vancouver, British Columbia, Canada), Mediterraneo (Greece), Mystic Peaks (Nepal) and a bonus track Monolithic Studios (a fictional Hollywood film studio lot with gigantic drive-through sets), which could be unlocked by winning the Knockout Competition. 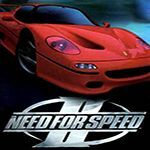 There is also a Special Edition of Need For Speed II, which adds 4 new cars (Italdesign Nazca, Ferrari 355 F1, Ford Mustang Mach III, Pontiac GTO), and 3 unlockable bonus cars (a NASCAR, a concept Indycar and a custom racer) and an new track (a South American jungle). However I do not have this version of the game. While I took the pictures for this page I played Need For Speed II again for a bit and although it feels much more primitive now I still enjoyed it somewhat, it's one of those driving games where you do feel like you're going fast (the cars in this game do over 200mph, I'm not sure if the game simulates that speed 100% realistically but it feels fast enough), the cars in GTA3 and Vice City didn't quite feel that fast. Except this time I worked out that there was a difference between simulation and arcade mode, the latter is a lot better because the cars handle less rigidly and it's much easier to powerslide through bends. And after playing games like GTA3 I'd realised it's better to use a 3rd person camera view than a 1st person one (your field of vision is much more limited). I loved the T-Rex...when you pushed the horn it sounded Roarghhhhh!! Damm, I had NFS: Road Challenge and there are cool traffic cras such as the 2CV, Beetle, 1500, Camper, Kenworth and a school bus that wasn't even in it! Not to mention playable cars such as the Isdera and GT90. where is the Mustang from SE version? That's because I don't have the Special Edition, just the original version. Ok, then upload it. My favorite games in my PS One. And the songs are great to heard for long times until these days. Am I right? Check the comments to see if the car is available in the Special Edition only. Still no Mach III, F-355 and Pontiac GTO? RVR72GV wrote Still no Mach III, F-355 and Pontiac GTO? These are already uploaded, just wait to be approved. Aha, I think G-MANN probably used unreliable source. I can practically see the doors of the Mclaren F1 closing in front of me! Is there anyone got the iso file for this game? i have the CD. Why are you asking? is something missing here? Now what we need is that T-Rex car! RVR72GV wrote Now what we need is that T-Rex car! can these new vehicles called cars? sajmon14 wrote can these new vehicles called cars? If we're listing the T-Rex, we need to list the crate. And the souvenir stands. And the log. And the outhouse. The game has plenty of things you can "drive" with a cheat code that aren't cars. Hell, this game is still fun to play. Should we add the cars from the intro and list as only seen in CGI scene? I have added the Corsa and Punto, The latter is a 1995-1999 due to the bumpers no longer being body-colored. Wait, since when did we decide to add live action cars? ItsaUserName wrote Wait, since when did we decide to add live action cars? They are part of the intro. Reminds me... How about setting up the IYVCD? (Internet YouTube Car Database) It´s A LOT of work, but we would never run out of material to list! Gamer wrote Reminds me... How about setting up the IYVCD? (Internet YouTube Car Database) It´s A LOT of work, but we would never run out of material to list! It would be of more sense and use to list every instance of a car ever made, which would take years of sifting through DVLA documents, youtube videos and vanity plates. If anyone want cheats of this game then this is the list. I played it on a Win7 Vaio PC with my friend in 4th grade and it ran great. Gamer wrote I played it on a Win7 Vaio PC with my friend in 4th grade and it ran great. You people all hate cars from intros. I'm udderly upset. It's not like they were the actual game version. They were a version in the Intro. I'm ticked off. And I don't want to hear any bad excuses for it either. Well don't go giving away points for me. . But I lost I think 10. It's not a huge loss. I'm just upset about it. But like I said, the NFS Underground cars were different models from the in-game versions. So I should have lost only about 6 Points. Burn Rubber wrote Well don't go giving away points for me. . But I lost I think 10.